Europe remembers Kheir-ed-Din Barbarossa as a pirate, a murderous corsair, a thief and considers him an insignificant figure. It is this image that has become popular. Contrary to popular belief, Kheir-ed-Din was a highly cultured and intelligent man who had a significant impact on North Africa, the Mediterranean Sea and he left behind a legacy that would endure for at least 3 centuries. Kheir-ed-Din Barbarossa began his career under the tutelage of his older brother Aruj. The two brothers left Lesbo (off the coast of Turkey) for North Africa in their early twenties with nothing more than 2 galleots. By the time Aruj is killed in battle 14 years later, they had a small fleet and created a land kingdom, the Kingdom of Algiers. For the next 15 years after the death of Aruj, Kheir-ed-Din would consolidate and expand the Kingdom further. The Kingdom of Algiers would last for 3 centuries and dictate trade and the movement of ships in the Mediterranean well into the 19th century. This by itself would have marked Kheir-ed-Din as a man of significant stature but this was just a prelude. Sultan Suleiman the Magnificent of the Ottoman Empire was in desperate need of a competent naval commander. The inexperienced Ottoman navy was not able to keep pace against the seasoned Genoese and Venetian fleets. They had trouble just protecting their own territorial waters and this prevented the further expansion of the empire. Kheir-ed-Din's reputation preceded him and the Sultan summoned him to his court. When Kheir-ed-Din entered the Golden Horn, he was greeted by generals and heads of state in all their pomp and splendor. Kheir-ed-Din arrived as a burly, weathered and battle scarred warrior but with a confidence and dignity that only a self made man can project. 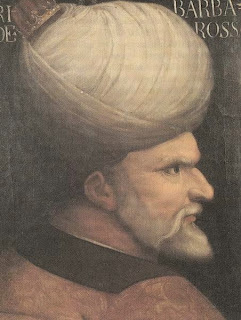 Sultan Suleiman appointed Kheir-ed-Din commander of the Ottoman naval fleet. He would be rewarded greatly for the confidence he placed in Kheir-ed-Din. Kheir-ed-Din reorganized the dockyard system which would serve the empire for many years. 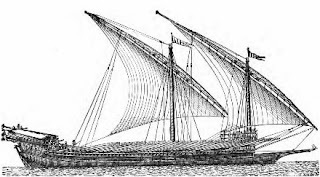 He rebuilt the fleet from the ground up using his vast knowledge of ship building gained from his days in North Africa and most importantly he changed the quality of the sailors who served on the new Ottoman Navy. Once the fleet was ready, Kheir-ed-Din would sail immediately into the Mediterranean Sea. Over the next several years he would conquer everything in the Aegean, the Ionian and ravage the Italian coast, culminating in a major navel engagement at Preveza against the combined fleets of Venice, Genoa and the Pope under the feared Genoese commander Andrea Doria. Outnumbered by nearly 50 ships, Kheir-ed-Din would defeat Doria and establish Ottoman supremacy at sea. By the time Kheir-ed-Din Barbarossa retired, the Mediterranean from the Black Sea to the Atlantic coast of Morocco was a Muslim lake controlled by the Ottomans. It would remain this way for the next 30 years. Kheir-ed-Din would never return to North Africa and the Kingdom of Algiers. He remained in Constantinople and in 1546, at the age of 63, Kheir-ed-Din passed away peacefully. Kheir-ed-Din is celebrated in the Muslim east and is held in high esteem no different than Admiral Lord Nelson in England. He was a highly cultured and intelligent man, conversant in 6 languages. In Turkey he is the subject of children's books and his navel victory at Preveza is marked by a national holiday. He is a national hero in Turkey and is considered one of the greatest men in the history of the Ottoman Empire. Kheir-ed-Din was no pirate but an empire builder. Bradford, Ernle. The Sultans’s Admiral Barbarossa – Pirate and Empire Builder. London. Tauris Parke Paperbacks 2009. Grant R.G. Battle At Sea – 3000 Years of Naval Warfare. New York. Dorling Kindersley Publishing 2008. I don't know how the rest of Europe views Barbarossa but British history textbooks rate him as highly successful and influential and would argue with very little of this assessment, though to call so much of the Med a Muslim lake is perhaps a slight exaggeration.